ESO operates the Atacama Pathfinder Experiment, APEX, at one of the highest observatory sites on Earth, at an elevation of 5100 metres, high on the Chajnantor plateau in Chile’s Atacama region. APEX is a 12-metre diameter telescope, operating at millimetre and submillimetre wavelengths — between infrared light and radio waves. Submillimetre astronomy opens a window into the cold, dusty and distant Universe, but the faint signals from space are heavily absorbed by water vapour in the Earth's atmosphere. Chajnantor is an ideal location for such a telescope, as the region is one of the driest on the planet and is more than 750 m higher than the observatories on Mauna Kea, and 2400 m higher than the Very Large Telescope (VLT) on Cerro Paranal. APEX is the largest submillimetre-wavelength telescope operating in the southern hemisphere. 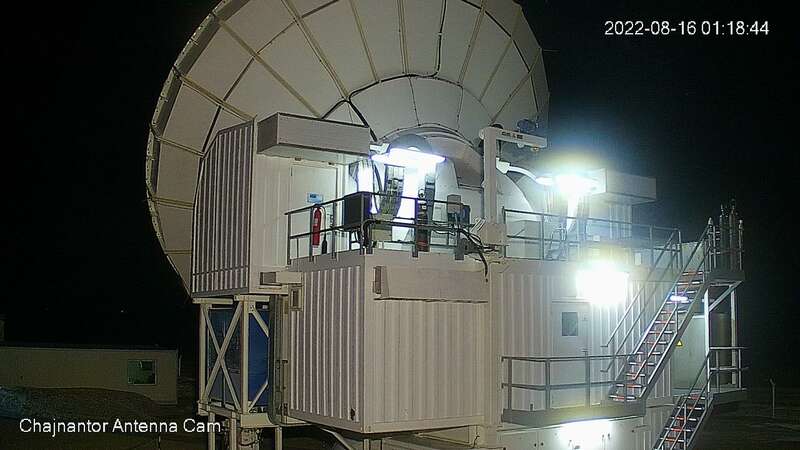 It has a suite of different instruments for astronomers to use in their observations, a major one being LABOCA, the Large APEX Bolometer Camera. LABOCA uses an array of extremely sensitive thermometers — known as bolometers — to detect submillimetre light. With almost 300 pixels, it is the largest such camera in the world. In order to be able to detect the tiny temperature changes caused by the faint submillimetre radiation, each of these thermometers is cooled to less than 0.3 degrees above absolute zero — a frigid minus 272.85 degrees Celsius. LABOCA's high sensitivity, together with its wide field of view (one third of the diameter of the full Moon), make it an invaluable tool for imaging the submillimetre Universe. APEX was a pathfinder for ALMA, the Atacama Large Millimeter/submillimeter Array, a revolutionary new telescope that ESO, together with its international partners, operates on the Chajnantor plateau. APEX is based on a prototype antenna constructed for the ALMA project, and it will find many targets that ALMA will be able to study in great detail. APEX is a collaboration between the Max Planck Institute for Radio Astronomy (MPIfR, 55%), the Onsala Space Observatory (OSO, 13%), and ESO (32%). The telescope is operated by ESO. Submillimetre astronomy is a relatively unexplored frontier in astronomy and reveals a Universe that cannot be seen in the more familiar visible or infrared light. It is ideal for studying the "cold Universe": light at these wavelengths shines from vast cold clouds in interstellar space, at temperatures only a few tens of degrees above absolute zero. Astronomers use this light to study the chemical and physical conditions in these molecular clouds — the dense regions of gas and cosmic dust where new stars are being born. Seen in visible light, these regions of the Universe are often dark and obscured due to the dust, but they shine brightly in the millimetre and submillimetre part of the spectrum. This wavelength range is also ideal for studying some of the earliest and most distant galaxies in the Universe, whose light has been redshifted into these longer wavelengths.